Discussion in 'Historiography' started by TriciaF, Nov 7, 2018.
Who was more culpable - Petain or Laval? Petain was a very old man by that time, (born 1856), easily influenced by his younger colleague? Both received the death penalty only Laval copped it.Petain should have had the same fate. There is an article here: Canyon Of Vichy Heroes? "Petain was the premier of France’s Vichy government when he ordered the arrest and deportation of 77,000 Jews to Auschwitz; Leval served as his deputy head of state and foreign minister. In 1942, Laval began stripping French Jews of their rights and helped the Nazis capture and deport non-French Jews. He publicly proclaimed his support for Germany, saying: “An American victory would mean victory for the Jews and the communists. Both men were tried for treason after the war and sentenced to death. Laval was executed but Petain’s sentence was commuted to life in prison, where he died in 1951." In terms of "Who was more culpable - Petain or Laval?" ultimately I would have thought that Petain was the more senior. Nb. though, both Petain and Laval were, initially, sentenced to death for what they had done. it says there: "After the war, Pétain was tried and convicted for treason. He was originally sentenced to death, but due to his age and World War I service his sentence was commuted to life in prison and he died in 1951." TriciaF and Harry Ree like this. "President Macron's Petain Nazi collaborator remark creates row"
"He was a great soldier", although he had made "disastrous choices" during the Nazi occupation of France. CDG commuted the death sentence verdict on Petain,the Hero of Verdun.He was incarcerated on the Ile d'Yeu a small island off the coast of Vendee Here he served the life sentence and is buried there. CDG's early military career service was under Petain and this led to his mentoring by Petain.It would appear that at one time they had a friendly relationship which led to CGD's son Philippe being named after Petain. Petain's High Court trial was based on his Vichy representation from 11 July 1940 when the Vichy regime was established and not from his alleged activity with the Cagoule before the war.He was found guilty of "intelligence with the enemy". As said, his record of military service with France during the Great War and his age was taken into consideration.However regarding his age Petain was considered to be senile.The jury recommended that on account of his age the sentence should not be carried out but CDG already held the view that if found guilty and a death sentence imposed, the death sentence would be commuted and he would be imprisoned for two years. CDG ensured that the death sentence was commuted but was unable to effect the term of imprisonment as he was out of office. Petain spent the rest of his life on the Ile d'Yeu,dying in July 1951. As to Petain's appearance before the High Court,his senility was never open and admitted by the Vichyites and those of the Resistance. Vichyites did not want to expose themselves as being the followers of a senile old man and those of the Resistance did not wish to present Petain as an object of pity. Laval quickly took advantage of the defeat of France and the following armistice becoming the prime mover in transforming the French political system.As Petain's Prime Minister and deputy,he went on to act as Vichy's enforcer and saw France's priority as being in league with Germany.He acquired the real effective political power of the Vichy regime.German demands and racial ideology were met without question.His view was that Germany had won the war and France should adopt a stronger role with it's "partner" Germany.Anti British and declaring his wish for a German victory over the Anglo Saxons,he was one of three French deputies who voted against the Treaty of Versailles back in 1919. His trial in early October 1945 was turbulent,with the absence at times of his defence and when the verdict was pronounced,both defence and Laval were absent.Found guilty of high treason and complicity with the enemy,Laval was sentenced to death. CDG dismissed a retrial and refused to commute the sentence of death.He was executed by firing squad on 15 October 1945. TriciaF and Ramiles like this. Thanks for that resumee. When I started to think about this question I didn't know Petain's age. Why was such an old person put into that position? Perhaps because he could be easily manipulated? Episode 32-French Premier Reynaud falls. Reynaud falls and Marshal Petain takes over. Episode 33-Premier Petain seeks peace. Petain rushes to find peace, giving little thought of the price. Has for example: "A pessimistic speech by Lloyd George on 7 May 1941 led Churchill to compare him with Philippe Pétain." This is probably about the (horrific) experience of an old man who had seen the horrors of World War 1 and wanted, albeit in a misguided way, to shorten the current - WW2 - conflict. Explains it but doesn't excuse it. Within the note from US Ambassador to Vichy France, William D Leahy to FDR, on 22 November 1941 assessed the political situation in Vichy France as ...."headed by a feeble old man, surrounded by self seeking conspirators"
From the Vichy infighting,Laval was sacked as Prime Minister in December 1940 but Petain was obliged to recall him in April 1942 due to German pressure.Laval ensured that Vichy was firmly dovetailed in the European New Order....he was clearly Hitler's man. It would appear that the US was among the first to recognise the new Vichy regime.I would think that CDG remembered that all too well. Isn't that a case of "keep your friends close and your enemies closer"? Albeit one which does not even mention Laval, but has sections such as: "Did the French public support the Vichy leaders?" and "What’s the legacy of Vichy France today?" Vichy in Auvergne is a popular spa resort town that experienced its heyday during the Belle Epoque. Built in an area that experienced large amounts of volcanic activity in the past, Vichy is home to thermal spas whose supposedly healing waters have gained it a reputation as a place for hydrotherapy. Though the spas were known before the18th century, it was under Louis XVI's rule that the spas underwent improvements to become the luxurious baths that attracted the rich during France's 'golden age' of the Belle Epoque during the late 19th and early 20th centuries. Vichy has several different water sources, some warm and some cold, with the source des Celestins the best known and whose waters you can drink from fountains in the Hall des Sources. Located in the remains of a convent, the naturally carbonated waters of the source des Celestins emerge at 22°C and are said to have health benefits when ingested. Water from Vichy's sources are used in hydrotherapy treatments in several spas in the town." "Take in some culture with a visit to the Opéra de Vichy with seasons in the summer and winter and visit the museum of the Vichy opera containg old posters, programmes, costumes and photographs. There is also a Vichy municipal museum where you can journey through Vichy's history and art history with rooms devoted to archaeology and collections of art including paintings and sculpture, and a museum of African and Asian art, La Musée des Arts d'Afrique et d'Asie.Take time to admire the wonderful 19th and 20th century villas and hôtels which were once taken over by the Vichy France regime during WW2. If you'd like to explore Vichy without all the walking then why not take the little tourist train? Vichy also has some wonderful parks and gardens including the parc Napoleon III full of lush greenery. The city hosts several festivals throughout the year with vintage car rallies, fireworks displays and Les Jeudis de Vichy (Thursday from Vichy) where an art market, shows and workshops are put on for children every Thursday from mid-July to mid-August. Vichy is great for shopping with over 500 shops in the heart of town that are open 7 days a week including boutiques, jewellers, antiques dealers and bookshops. The town also has a shopping centre and a Grande Marché filled with 65 local farmers' stalls where you will find some great fresh produce. Famous for Vichy pastilles, little white octagonal sweets that are said to aid digestion, Vichy is also a great place to pick up some of Auvergne's local cheeses. Go out for a gourmet meal at one of Vichy's Michelin star restaurants but don't expect to be served vichyssoise soup as a local speciality as it was created by a French chef in America and named after the town!" ...but I do wonder if they would have chosen to stay there. i.e. the wiki has "While Paris remained the de jure capital of France, the government chose to relocate to the town of Vichy, 360 km (220 mi) to the south in the zone libre, which thus became the de facto capital of the French State." So I imagine that they ultimately were after a long term goal, though it's hard now to see how any of the Vichy Govts actions were going to "pay off" - I wonder where Petain and Laval actually saw their actions as ultimately heading to? The selection of Vichy as the post armistice seat of the French government was tied to the ongoing military and political situation leading to the fall of France. When the Third Republic fled to Paris during the critical period when it was envisaged that Paris would fall,the government relocated to Bordeaux where Petain became the last President of the Third Republic.After the armistice had been effected,the "armistice" government headed by Petain had a choice to select and establish a location for the of seat of government...setting up the seat of government in Bordeaux or returning to Paris would have resulted in the armistice government being located in German occupied territory and in the shadow of the occupier. Vichy, in the unoccupied zone, proved to be an attractive location,a renowned spa town.....Vichy water...with an abundance of quality office accommodation available in the many hotels for the "armistice" government to function. Laval in his defence stated that had the armistice not been agreed and the Vichy government not been established, there would not be an unoccupied zone.Further, without it with collaboration, it would have led to further German hostility towards France.However this is discounted by the fact that after the Torch landings,the Germans occupied the unoccupied zone without any reference to the Vichy government and the armistice terms. Before the Torch landings,Hitler was content to allow unoccupied territory in France on the grounds that Vichy would maintain order over the unoccupied zone and its population.Had there been a conventional defeat/whole occupation, he would have been faced with the French government fleeing to North Africa where a continuation of the war would likely follow. (Those who did in an effort to continue the war were put on trial in their absence by Vichy) As it was,France had been knocked out of the war and no government in exile came as a result. Opposition to the legality of the Vichy regime and the invader came from the other France,the Free French,led by a little known French Army colonel who claimed to speak for and represent the legal France. There is still a legacy of the Vichy government is that Petain is revered as a WW1 military general and the Hero of Verdun. Macron's forthcoming tribute to him has drawn some adverse comment.In 1968, there was also remembrance by CDG to the Hero of Verdun when as President of France, he laid a wreath on the tomb of Petain on 11 November, a practice which apparently continued to 1992 by his presidential successors. In February 1973 Petain's body was stolen from the Ile d'Yeu cemetery by his supporters demanding that Petain should be buried among the army dead at Douaumont National Cemetery,Verdun. Located in a Paris garage, his body was returned to the tomb ob the Ile d'Yeu where from time to time ,the tomb has been subject to vandalism. Popularity......when the war was turning against Germany in April 1944,Petain on his first visit to Paris since the fall of France was met by an enthusiastic crowd, estimated at one million strong...four months later he was, as a prisoner, in the German provided safe haven of Sigmaringen. "Mandated by the head of Vichy, Pierre Laval, Bousquet demanded on 14 January 1943 that the operation be postponed for a week to better organize it and have reinforcement from police force. Furthermore, while the Germans were about to limit themselves to the 1st arrondissement of Marseille, Bousquet spontaneously proposed to extend the operation to the entire city. According to historian Maurice Rajsfus, he also requested complete freedom of action for the French police, which he obtained from SS Karl Oberg." "French police head René Bousquet, in fur-trimmed coat, posing with Nazi German officials"
Which can be back-translated (i.e. into English) which has some interesting differences. He was not perhaps of the typical Nordic / Aryan type that might generally have been thought to have been favoured by the Nazi's. There is for example the line: "Unaware of the seriousness of the acts with which he is accused, Laval frequently talks to his family about the day when he will resume his political career." Has a quote from De Gaulle: "Worn by nature, accustomed by the regime, to address business from below, Laval held that, whatever happens, it is important to be in power, a certain degree of trick always control the situation, that There is no event that can not be made, men who are not manageable. He had, in the cataclysm, felt the misery of the country but also the opportunity to take the reins and apply on a large scale the ability he had to deal with anything. But the victorious Reich was a partner who did not intend to compromise. So that, in spite of everything, the field opened to Pierre Laval, he had to marry the disaster of France. He accepted the condition. He judged that it was possible to take advantage of the worst, to use up to servitude, to associate even with the invader, to make an advantage of the most frightful repression. To carry out his policy, he renounced the country's honor, the independence of the state, and national pride. Now these elements reappeared alive and demanding as the enemy faltered. Laval had played. He had lost. He had the courage to admit that he was responding to the consequences. No doubt, in his government, deploying to support the unsustainable all the resources of cunning, all the springs of obstinacy, he sought to serve his country. May it be left to him! " A couple of points. The French government fled first to Tours, then, after a few days to Bordeaux. It seems that it was their intention to flee to North Africa; but the ship that was to take them, s.s. Mexique, was sunk by an explosion while anchored off Le Verdon, at the mouth of the Gironde, on 19 June. It was assumed that the explosion was caused by a mine, which had been laid by an aircraft on the previous night. I have it in my mind, which is increasingly unreliable, that Admiral Darlan was in charge at that time. Merchant seamen who landed on French controlled parts of West Africa were very badly treated by the Vichy; two are buried at Timbucto, the CWGC's most isolated cemetery, after release they reported that the treatment of the Jews, by the French, was even worse. One is tempted to excuse Petain on the grounds of old age, his great services in the First World War, and his desire to spare France a recurrence of the horrors of that conflict and to mitigate their lot under German rule. That is too charitable a view, both of Vichy as a whole and of Petain as a man, and I don't excuse him on any of those grounds. It is clear that during the 1930s if not earlier Petain had identified himself thoroughly with the far right in French politics. He knew what he was doing. Vichy was not simply unscrupulous opportunism, though quite a few unscrupulous opportunists were involved in it. A segment of the French body politic had never been fully reconciled to the republic and for the French far right Vichy represented a longed-for opportunity to put the clock back, if not to 1788 then at least to 1870. Worse, until at least 1942 Vichy had the active support and/or passive acceptance of a great many of the French. Laval and Darlan were more deeply immersed in all the filthy details--the persecution of liberals, leftists, Gaullists, and Jews, the throttling of the press, the sucking-up to the Germans--but Petain knew and gave his blessing to it all. See the works of Robert Paxton, the leading historian of Vichy in the English language. Harry Ree, Tricky Dicky, CL1 and 2 others like this. Obviously Vichy was a genteel location compared with Marseille. Marseille was said to be a hotbed of resistance and clandestine activity.It was also a stage for escape lines and the provision of safe houses for those fleeing from north eastern France.It was a well trod route from Marseiile for Gib via Spain. At the centre of these activities was the Old Port which was destroyed on 22-24 January 1943.The seizing of the unoccupied zone by the Germans also enabled them to roundup those of the Jewish faith with the aid of the French Police under Bousquet. While the armistice terms included an article that the French shall hand over to German custody those German refugees and "undesirables" residing in France...the majority were German Jews who had fled prewar Germany,there was no armistice article committing the French Police to take custody of French citizens of the Jewish faith.All Jews,both French and foreign were arrested in the Marseille roundup which was a typical example of the modus operandi of the French Police...... "following orders" was the excuse given by those who followed the Vichy line ....not that the French Police as a whole could be tarred with the same brush,others were patriotic and provided help and assistance to those in dire need and many were intertwined with organised resistance. 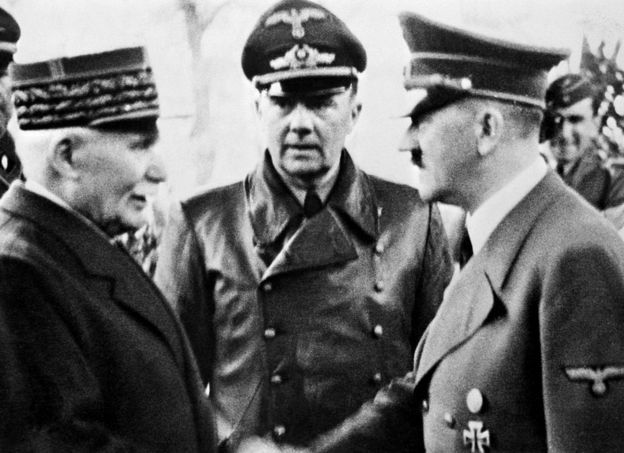 Just as Petain provided the key to Laval to follow a policy of collaboration and cooperation with the German occupier,Laval passed on the key to Bousquet with police matters when Laval was recalled as Prime Minister in April 1942. Bousquet was appointed by Laval as Vichy Secretary General of the national police,a role he had for 18 months.His job description was to provide an interface with,and collaborate with the German authorities for security and maintenance of order throughout the whole of France.With that responsibility, was added the implementation of the Vichy measures against Jews following the ideology of the NAZIs....a policy which would link Vichy to the Holocaust. Bousquet moved in the most influential German occupation circles,meeting Himmler but his main liaison contact was with Oberg,the head of German police throughout the occupied zone where the question of the utilisation of the Vichy police by the German authorities was discussed. Himmler was very impressed with Bousquet and agreed with Oberg that "Bousquet was a precious collaborator in the cadre of police collaboration"
Bousquet was more than lucky to evade the death sentence and was sentenced to 5 years national degradation which was later suspended.However in the late 1970s, the role of Vichy involvement in the Final Solution exposed Bousquet's past deeds.The Klarsfelds got their legal teeth into him and would not let go.After slow justice prevailed,they were able to raise a complaint against him for crimes against humanity in 1989,having made public Bousquet's involvement much earlier.Legal challenges followed to delay any trial,appeals were dismissed but before he could be put in the dock,Bousquet was assassinated in June 1993. Definitely one who got away with his crimes. Laval had previously served as Prime Minister on two occasions in the 1930s.His appearance drew the nickname of "the Jamaican".Throughout his life he had a dislike of Britain and it appears he was mistrusted among political circles. The Germans did not mind who they used to attain their goals.Laval's appearance was of no consequence.Some leaders of ghettos in the eastern territories were known to have met German demands for Jewish labour and for cooperation with their captors despite concerns from those in the ghetto.When the labour had been worked to death,the survivors and ghetto leaders themselves were transported to extermination camps and the ghetto destroyed.Similar the Ukrainians,as Slavs, regarded as the untermenchen were enticed into Third Reich service with a promise of independence when the Russians had been defeated. Goring was well known for his declaration when he encountered a challenge on racial purity...."I will decide who is a Jew"
The collapse of the Third Republic at Bordeaux and the Massilia affair. In the aftermath of the German onslaught and the fleeing of the Third Republic seat of government to Bordeaux,it was anticipated by 16 June 1940 that the Third Republic government would depart from Bordeaux to carry on the fight from Algiers.The liner Massilia was berthed at Le Verdon awaiting instructions for this purpose.Meanwhile the government was split into two factions,one supporting Petain and Laval to parley with the Germans and the others such as Georges Mandel to conduct the fight outside France.At this point there was intervention from Raphael Alibert,a long time anti Semite who in Petain's name sent messages to ministers to remain in Bordeaux and from Laval who campaigned for Assembly Deputies to remain in France.The Massiia sailed on 21 June, carrying one Senator and 26 Assembly Deputies who were against any armistice out of 200 who had followed the government to Bordeaux.Unknown to the likes of Mendes-France,Mandel and Zay,during their time at sea,the Third Republic had collapsed.There would be no government in exile and these three would carry penalties as appropriate to the anti semitic policy of Petain and Laval....arrested on reaching Casablanca,the likelihood of resistance to the Germans external to France was threatened. Alibert later boasted of his intervention that without his deception Petain would never have been able to establish Vichy. As it was, France was led during the occupation by a Great War general,fit for purpose for the Great War as the defender of Verdun but proved to be an incompetent politician, exposing his countrymen to the consequences of an allegiance with the European New Order.His deficiencies as a statesman allowed a free hand to Laval who was more than eager to be complicit with the ideological demands of the occupier.